As a direct descendent of Dura-Ace, no other road component group provides the same cost-performance value as Shimano 105. The Octalink V1 8-spline interface between the BB and crank arm forms a strong highly rigid connection that reduces weight and increases strength. Note: crank arm fixing bolts not included. Needed to replace my Ultegra BB and finding those are like looking for unicorns. The 105 is just a tiny bit heavier ( about 1/2 glass of beer at most ). It seems to be a little rougher than the Ultegra, but maybe it just needs some miles to wear in. Because v1 Octalink has been discontinued, Shimano is only making this one 5500 (105 level) v1 Octalink bottom bracket to support all the v1 Octalink cranksets out there in the market still being used. So the 6600 (Ultegra) bottom bracket and 7700 (Dura Ace) bottom bracket are both discontinued. The unfortunate thing about these bottom brackets is they do not last. I have to buy a new one basically every year because they develop play in them, and there is no adjustability - which is unfortunate, because even the really cheap Shimano LP-20 BB's are even adjustable/rebuildable. I used to be able to get this exact same 5500 bottom bracket for just $29 here on Jenson (just went and looked at my Jenson order history), but I guess because they are becoming rare and people need them, they can charge more. Having to spend $50 every year on a new bottom bracket is a bit unrealistic. At that price you may be better off buying a new crankset with outboard BB's (cheap options are Shimano Sora which supports 9spd - since anyone needing this has 9spd, or even FSA Gossamir cranks). I have not decided what I am going to do yet, because the idea of buying another one at this price is disheartening). Typical good Shimano quality at a reasonable price. Used this to replace a worn out BB for my old Dura ace 7700 9spd cranks. Octalink is getting rare, but it's soooo good! Recently Octalink isn't for the race, but 105 grade BB is still produced. Not so expensive as Dura Ace, not so fragile as BB-ES300 with plastic left cup, this is a good choice. Made in Indonesia, Shimano quality. Stock bottom bracket on my 2002 Trek 520 touring bike which I bought used. I've put about five or six thousand miles on the bb now without any signs of bearing failure. I have no idea how many miles the original owner put on the bb. While it doesn't have the advantage of a Hollowtech2 system (replaceable bearings) it does have better seals than an outboard style bearing would. The downside to Octalink is that while the spindle is larger than square taper (for increased stiffness) this also requires that the bearings be smaller due to space constraints which theoretically results in shorter bearing life. Not sure what is inside the cartridge (I've read that it's needle bearings) but I've been perfectly happy with the longevity of the product. For the other poster, the reported early failure must be due to riding style or possibly some other issue. This is classic Shimano.... well-made using excellent materials. fits nicely on my bike and crank set. smooth as butter. Customer service helped me find out what I needed and at the best price in the country! An octilink bottom bracket that connects the Shimano triple crank is not easy to find. 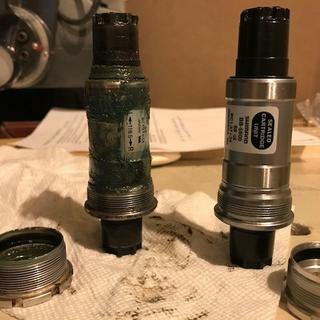 This one matches the old one which had worn bearings and seals that leaked all the internal grease. You'll need to have the special socket and crank remover bolt sets to take the old one out. Old and new S x S.
Installed easily and made a big difference. I purchased this part because my Ultegra equipped bike needed a new BB and the BB6500 is no longer available. Fortunately, the BB5500 is compatible and works great. After many thousands of miles my bottom bracket was noisy. When I took it apart this was the exact same part number originally installed by the bike manufacturer. I figured any part that lasted this many miles was fantastic. I ordered this same part and the noise is gone. Very affordable part to make the bike sound like new again. The product was delivered in a timely manner in an undamaged package. It was easy to install. My contact person at Jenson was very helpful both on e-mail and on the phone during the sizing and ordering process. The BB 7700 bottom bracket is worth the extra money if you can find it. It can be rebuilt too. Bolts not included, how about caps? BEST ANSWER: includes everything you need to replace bottom bracket. see picture. would obviously not include the bolts (or caps?) that you have to take off to get the pedals and cranks off. The unit comes as shown in the illustration. No extra parts.